Billy Collins’s witty poem “Introduction to Poetry” offers several whimsical suggestions to confused and frustrated readers of poetry. He asks readers to hold a poem “up to the light” or “press an ear against its hive”. Instead of tying “the poem to a chair with rope / and torture a confession out of it,” people should read poetry for what it is, rather “to find out what it really means”. The same can be said about contemporary painting. In a world of artwork that is often cerebral and unapproachable for the everyday person, Nathan Pankratz’s second solo show at Bridgette Mayer Gallery, So many ways to say I love you, I think I’ll try every one accomplishes what few of today’s painting shows do: it presents paintings as paintings, not as intellectual exercises that require an essay to deconstruct. That is not to say, though, that Pankratz is only concerned about aesthetics. 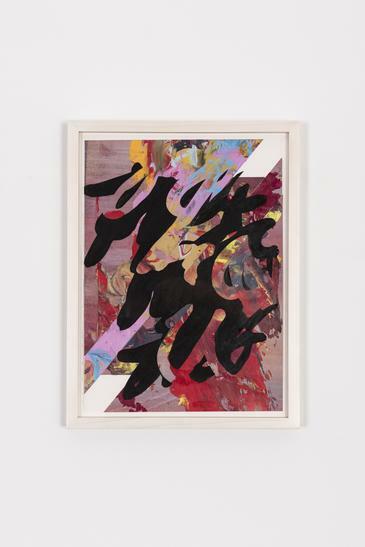 The choice of playful titles permits viewers to read some content into the abstract and technique-focused paintings, making his work quite approachable. Pankratz is a founder and member of Tiger Strikes Asteroid from 2009-2011, and he and I both work at The Haverford School, he as a middle-school art teacher and I as a substitute teacher and assistant crew coach. Between classes and recess duty, Pankratz and I often engage in great conversations about art. Just the other day during lunch, we discussed portrayals of Andy Warhol in film. We both agreed artist Julian Schnabel, who directed “Basquiat,” excels as a filmmaker, and I recommended that he watch the hilarious and poignant “I Shot Andy Warhol”. We also talk about modern art, technique, and theory. We understand that looking at art should focus on interpretation and meaning, but should also be grounded in an understanding of the medium and materials. Pankratz’s new body of work experiments with the possibilities of paint. He is a colorist, and his paintings focus on how colors in paint mix and work together across the surface of the canvas. His ideas are formalist and abstract. His luminous, semi-opaque colors are made using water-soluble acrylic paint. In “Chakakahn,” the painting is divided into horizontal registers, interspersed with layers of multiple colors that are carefully peeled away—perhaps using a masking process—in organic and hard-edged shapes. The technique is both physical and metaphorical; we want to look deeper at the work beyond the paint and find meaning. In his Wildthing paintings, Pankratz adds a number of black shapes into the composition to enhance and counter the vibrant colors. What may appear as intrusive in fact adds a new element to the surface. The black shapes shimmer due to the graphite mixed into the paint and add dimensionality to the flat surface. In “Forever Like Kindly Friends,” two small paintings are displayed next to each other. As the title references, these pieces act as a visual dialogue and most likely represent the conversation between two people; the lip-like forms are not hard to miss. There is a certain softness evoked by the cool and warm hues, almost skin-like. The ways the colors flow across the linen are very reminiscent of Morris Louis and artists of the Washington Color School. Also imbued with a sense of color fluidity, the Rainbows and Butterflies series is a group of compositionally symmetrical, Rorschach-like works on canvas with vivid, Day-Glo colors. While some of the works create a pulsating, almost synesthetic experience, “Rainbows and Butterflies 6” differs: its juxtaposition of organic brushstrokes and metallic pigments elicits an otherworldliness of chaotic order, like the psychedelic scenes from Stanley Kubrick’s “2001: A Space Odyssey”. The largest piece in the show, and my favorite, is “Reading Two Books At the Same Time”. The mop-like, broad horizontal brushstrokes against a glossy surface are quite calming, and they create an iridescent spectrum of cool colors that is as soothing as untouched water. Looking at the titles, the show is undeniably an homage to love and how it reveals itself to people. Yet the show also is a metaphor for the artist’s love of interacting with paint. The way the artist moves the brush across the canvas; allows the paint to mesh with other colors; and brings the brush to the end so the colors slowly drip over the edge of the canvas is a natural, even sensual, act of an artist’s love of his/her materials that is frequently forgotten but should not be dismissed. Nathan Pankratz, So many ways to say I love you, I think I’ll try every one is on view at Bridgette Mayer Gallery from Nov. 4, 2015 – Dec. 23, 2015.